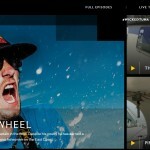 “Wicked Tuna” National Geographic project. 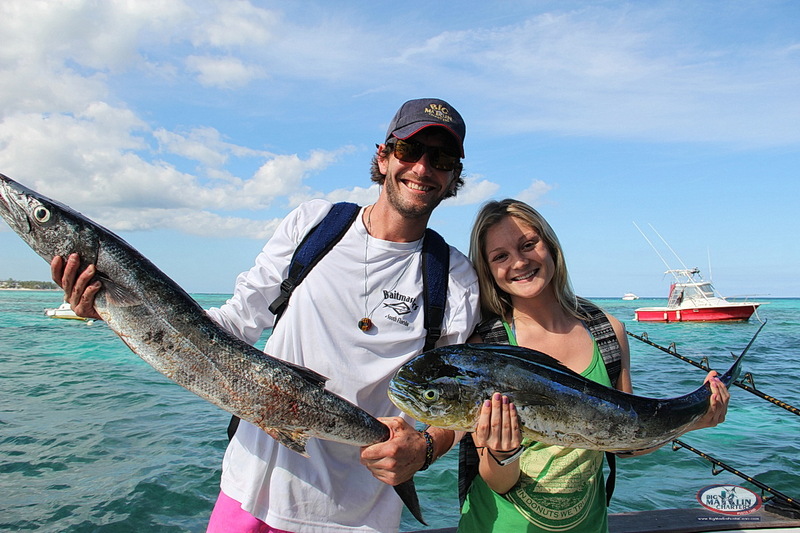 Our getting to know Tyler started with his girlfriend Savannah writing to our Facebook page “Big Marlin Charters Punta Cana” that she wanted to make a surprise present for her boyfriend. She told us that he is a legendary Captain Tyler McLaughlin from Pinwheel fishing boat. 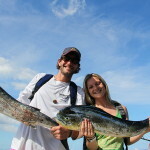 She said that she liked our website www.bigmarlinpuntacana.com and picked the boat Fortuna. Savannah suggested fishing date as well. We exchanged a few messages and the fishing trip was confirmed. It is a very easy process. 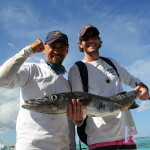 most interesting customers ever – a legendary Captain of Pinwheel fishing boat, who started catching tuna at 7 y.o.!!! (as I found out during our charter together). 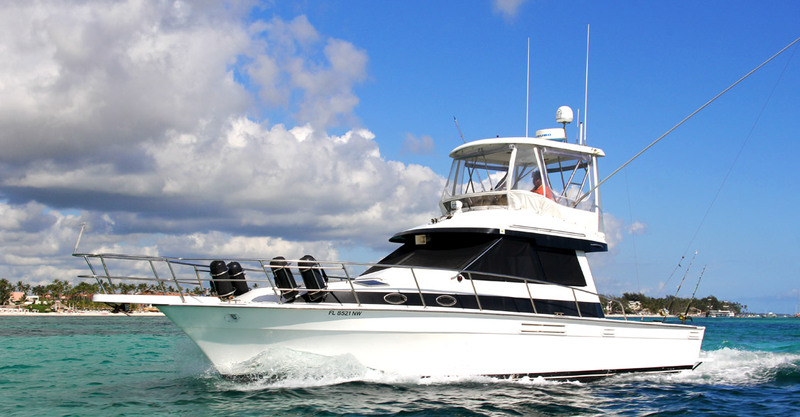 On December 12th morning, 2017 we picked up Tyler and his girlfriend Savannah from the Bibijagua beach (Punta Cana) at 7:30 am with our small motor boat and swiftly took them to Fortuna fishing yacht. 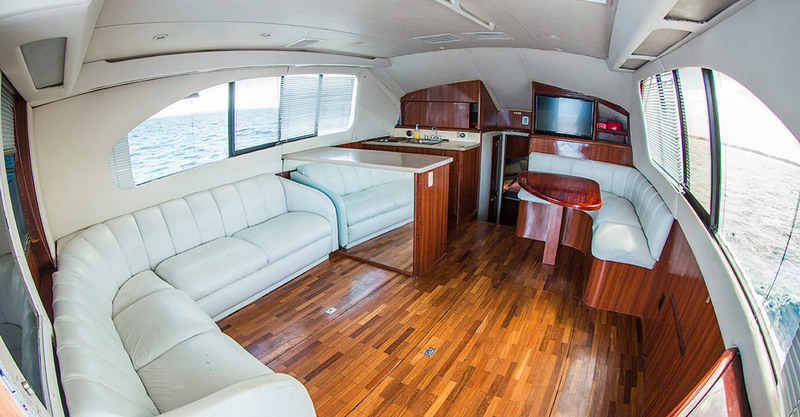 After we greeted each other I gave a small instruction speech about the boat, snacks, drinks and cold beer onboard. Right after that we started out for our deep sea fishing trip. The weather was perfect, the waves were maximum 3 feet high. While crossing the reef we were small chatting about how Tyler got into the National Geographic TV project, what kind of boat he is navigating, which engines it has, what kind of tackle and so on. Usual fisherman’s conversation. Tyler’s girlfriend was feeling comfortable relaxing on the fly-bridge, she didn’t participate in our conversation. 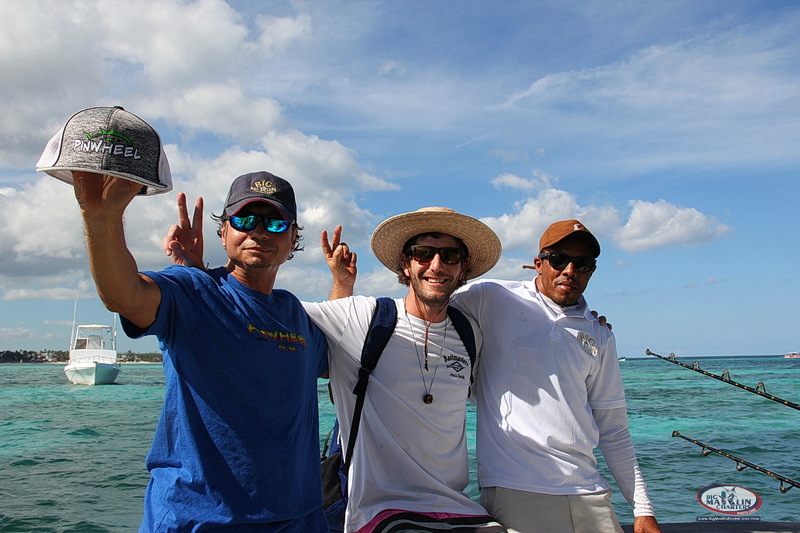 We arrived to our trolling spot in about 40 minutes with help of Garmin navigator, and slowed down approximately across from the Macao beach. We opened our outriggers and started fishing. 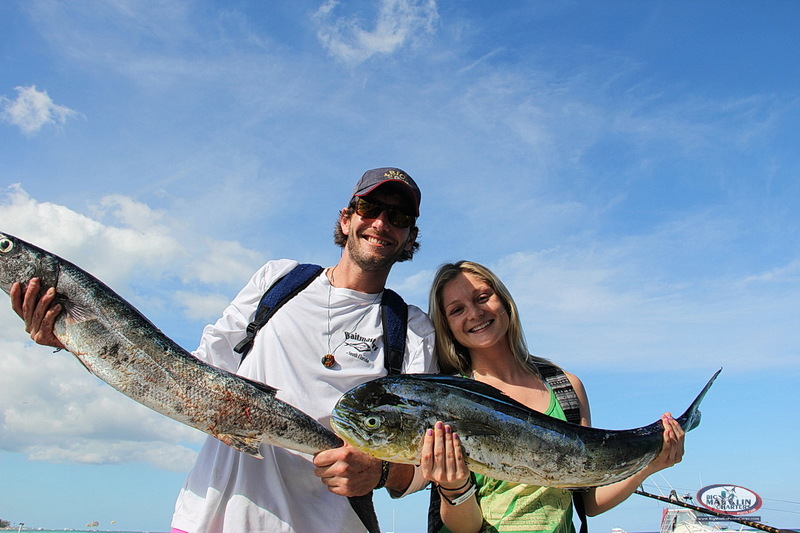 In about 5 minutes we hooked first Mahi, regular size. Savannah, who was near us at that time pulled that fish aboard. 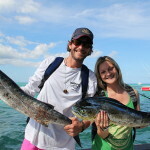 In another 15 minutes she pulled her second fish Barracuda, which was a very good size! 12 pounds! Fishing continued. Tyler found cold beer in the fridge and didn’t want to pull any fish. But I do understand him. 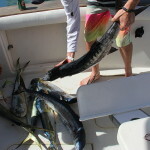 After he was catching Tuna 1200 pounds!!! and fishing every day sometimes you just want to have a beer and relax. 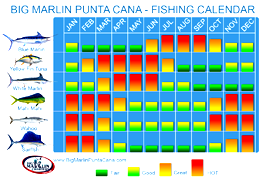 But sun got hotter and fishing excitement got stronger so soon we had two Mahi hooked. I pulled one and Tyler the other. 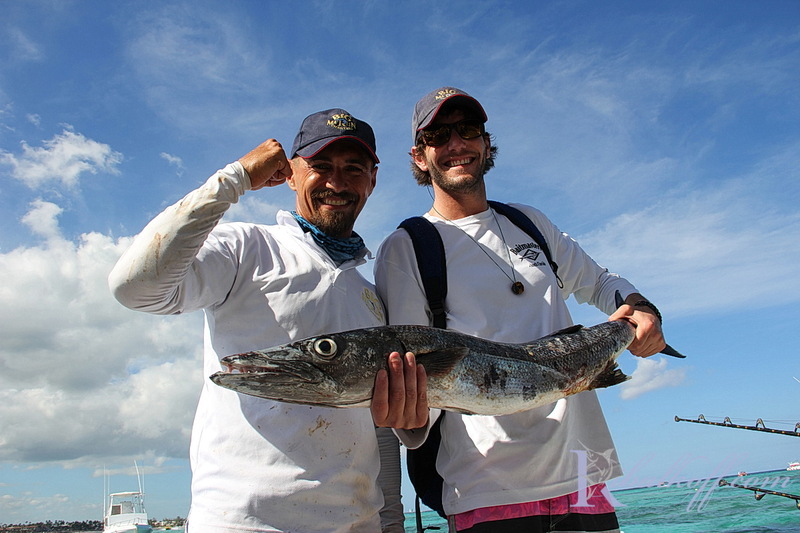 Our first mate Alex was doing a great job, he was everywhere at the same time, right in time to give a hand. 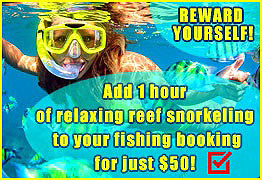 We have two cameras, one in the back with deck view and another with front view of the fisherman. And it is also Alex who works with our videos as well. I do pictures. We are very coordinated fast and precise. Everything is on time. Bait is always in the water, and we keep checking them. The deck is always cleaned from fish blood. 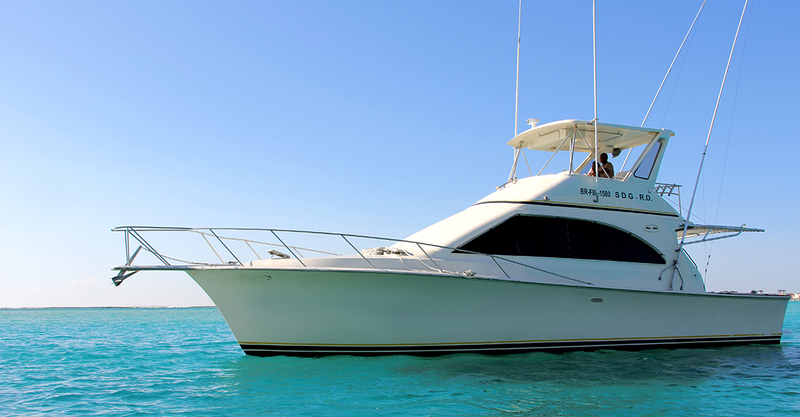 Tyler’s girlfriend stayed either in the shade under bimini or on the flybridge observing the action. 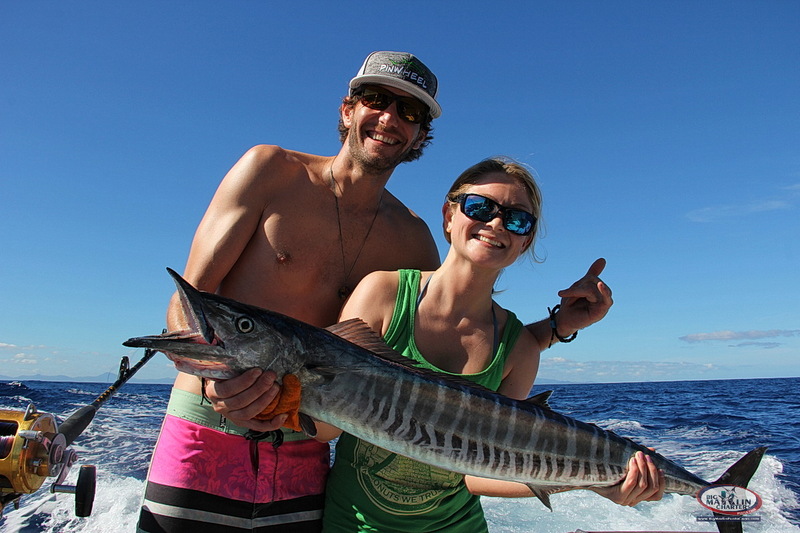 As time went by Savannah came down to us from the flybridge to see our fussing around with fishing, exactly at that time we hooked a Wahoo. 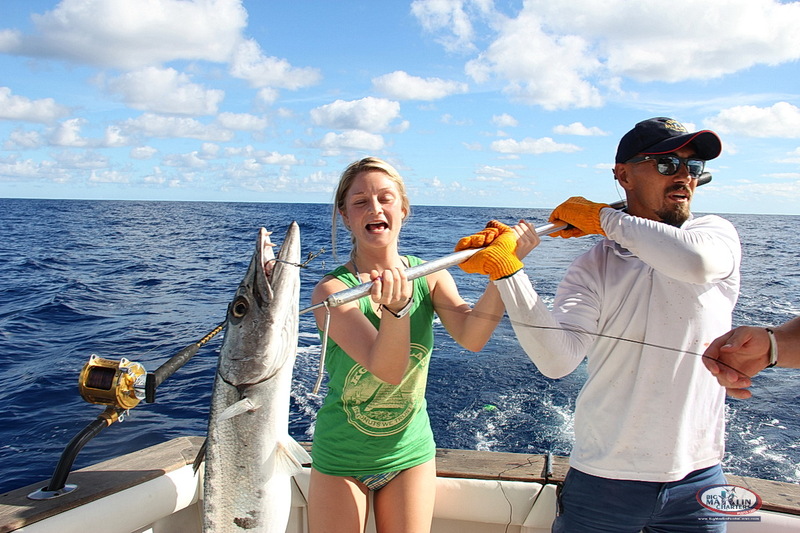 Savannah got in the fighting chair and began to work with the reel. We were cheering her up and in about 15 minutes the fish was already aboard. 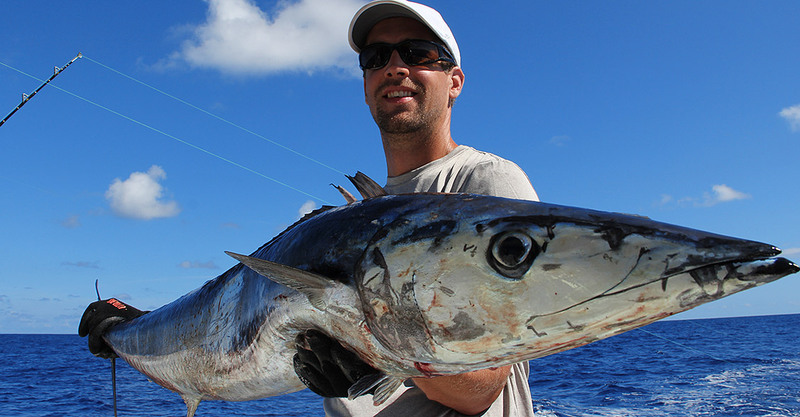 Quite a Wahoo it was! About 26 pounds. We all were very happy and in a great mood! Tyler was helping us so much by working with reels and cleaning cons from the seaweed. It actually felt like he was not a guest but a second mate! 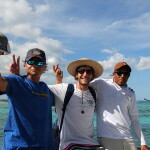 As a result of such productive team work after 4 hours we had 7 fish aboard and we were ready to turn back to the shore. On the way home Tyler had his 7th bottle of beer and told us a bit about how sponsorship works for him just great. All the reels, equipment, outfits for fishing and all other fishing gear he is given by his sponsors. And overall he said that he loves what he does. And why wouldn’t he! When you perform your favorite activity and your sponsors take care of your tackle. You don’t need to look for reels or parts for them on Ebay. If the reel is broken Tyler just changes it to a new one in 5 minutes and he’s again off catching tuna! In about 30 minutes we came into Marina. 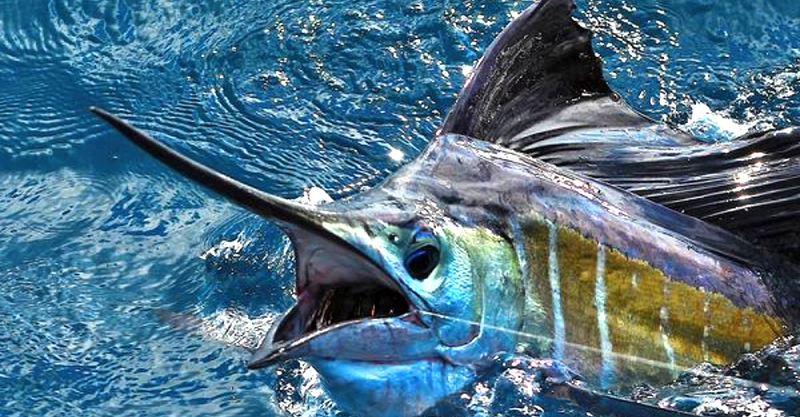 We became friends during our fishing trip and decided to participate in the White Marlin tournament in May. Tyler said he will pay all the fees and fuel. Of course me and Alex are all for that! Everybody was very happy with the day we spent! Tyler, his girlfriend and us. 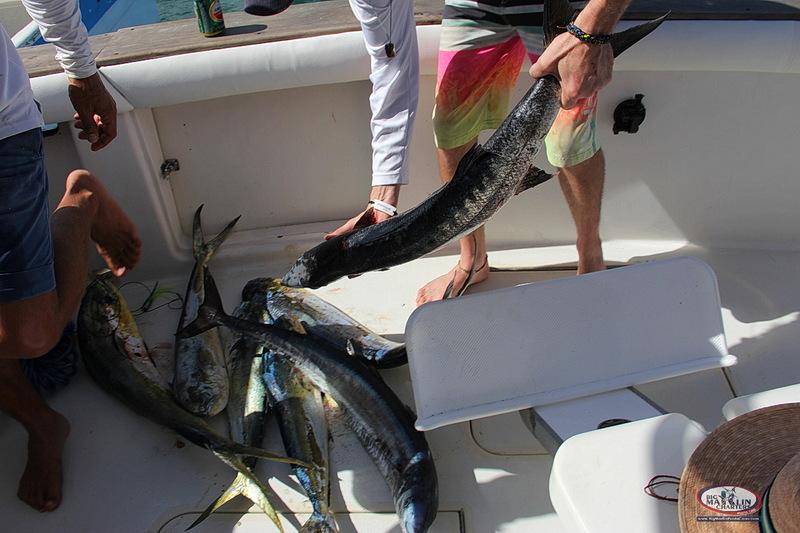 Fishing in Punta Cana was a success! We made some pictures for our good memories, gave each other tight hugs and took our guests ashore on the small motor boat. In the evening we met in a small restaurant on the beach, but that is another story.